What's the cheapest rental available in San Francisco, right now? SAN FRANCISCO -- If you're looking for a rental, you know how hard it can be to find a good deal. So what does the low-end rent on a rental in San Francisco look like these days--and what might you get for the price? First, there's this 225-square-foot apartment, with one bedroom and one bathroom at 10 Brooklyn Pl. in Chinatown, that's listed at $1,650 / month. In the unit, expect hardwood floors, high ceilings, closet space, wooden cabinets and granite countertops. Good news for cat lovers: kitties are welcome. According to Walk Score, the area around this address has excellent walkability, has some bike infrastructure and is a haven for transit riders. Over at 1082 Post St. in Polk, there's this 320-square-foot studio apartment, going for $1,700 / month. In the unit, the listing promises carpeted floors, wooden cabinets, ample natural light, a walk-in closet and high ceilings. In the building, expect an elevator, secured entry and on-site management. Neither cats nor dogs are welcome. Walk Score indicates that the area around this address has excellent walkability, is very bikeable and has excellent transit. 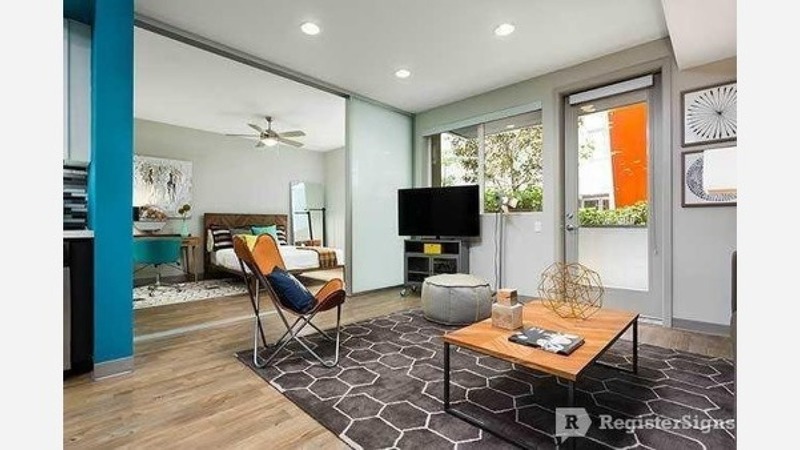 This studio apartment, situated at 1651 Market St. in SoMa, is listed for $1,725 / month. In the unit, you can expect French doors, bay windows, built-in storage and an oven. Pets are not welcome. Walk Score indicates that the surrounding area is a "walker's paradise," is easy to get around on a bicycle and has excellent transit. And here's a studio apartment at 1825 Mission St. in the Mission, which is going for $1,750 / month. In the unit, you're promised central heating, a mix of hardwood floors and carpeting, wooden cabinets and stainless steel appliances. Amenities offered in the building include outdoor space, on-site laundry, an elevator, secured entry, assigned parking and a fitness center. When it comes to pets, both meows and barks are allowed. Walk Score indicates that the surrounding area has excellent walkability, is a "biker's paradise" and is a haven for transit riders. Listed at $1,800 / month, this 870-square-foot studio is located at 1126 Turk St. in Fillmore. In the unit, the listing promises both air conditioning and central heating, a balcony, a walk-in closet, a dishwasher, stainless steel appliances, hardwood floors and recessed lighting. When it comes to amenities in this wheelchair accessible building, expect outdoor space and on-site laundry. If you've got a pet, you'll be happy to learn that cats and dogs will be considered. And finally, there's this 450-square-foot studio apartment, at 1086 Post St. in Polk, that's being listed for $1,875 / month. In the unit, expect hardwood floors, a walk-in closet and high ceilings. The building features garage parking, on-site laundry, secured entry, on-site management and an elevator. Feline companions are permitted. Walk Score indicates that the surrounding area is extremely walkable, is convenient for biking and has excellent transit.